Happy New Year! !I figured it would be appropriate to share my 2018 intention with you at the end of this first week of the new year. I shared on IG recently that talking and thinking about my current physical condition with regard to where I’m at post-injury (read more about my experience on crutches in NYC this summer) has triggered a lot of frustration and other not-so-pleasant feelings. Upon further reflection, I do believe that this is my “gift of injury”—I was forced to question my abilities, my WHY, and my priorities. Without planning for resilience to be my “theme” for 2017, the ability to keep moving forward was a recurring practice for me. My resilience skills are improving, and I believe this is because I have intentionally worked to increase my psychological flexibility during the past year. As I turn the page and enter 2018, I am even more committed to ensuring I remain true to my value of long-term health and wellbeing. This is not an easy task, given the messages surrounding aesthetics and self-worth that run rampant in our society and in an industry that makes a lot of money by convincing people that they are broken and need to be fixed. Therefore, I will practice intentional flexibility in my approach to physical and psychological health and wellbeing. I invite you to follow along with me to see how a flexible (vs. rigid) approach to training, nutrition, and mindset can be helpful during injury recovery, while retraining movements, and more generally in life. 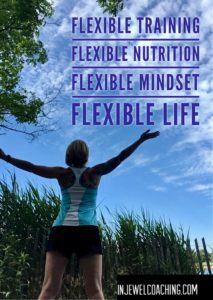 Intentional flexibility requires a high level of self-awareness to support day-to-day adaptations and the willingness to accept the mind and body’s current state. If you are currently struggling within a specific context or situation OR are about to make a change in your lifestyle, developing a higher level of self-awareness is a critical first step. The blurred picture to the right is of my own use of a tool called the ACT matrix. At the center, you can see it says, “ME…Noticing with Curiosity”. I worked through this exercise as a proactive strategy for my current goal to rehabilitate my body and make progress in the gym while using a flexible approach to training. 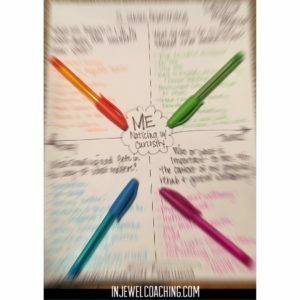 The use of the ACT matrix in this manner allows me to think ahead about how my internal experiences (thoughts, emotions, sensations, urges, feelings) might influence the choices I will have to make along the way toward meeting my values-aligned goal. As we start the New Year, many of us have set intentions or resolutions with some pretty amazing goals.While moving in the direction of your goals, obstacles will appear, mistakes will happen, and feelings of self-doubt and discomfort will surface. This is completely normal! 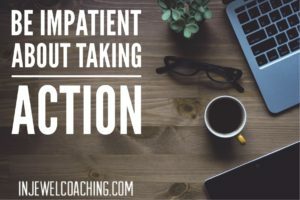 By noticing with curiosity during this process, I will be more self-aware of my “hooks”, allowing me to take time to pause and create the space to commit to act in a way that moves me closer to my goal even during times of struggle and discomfort. 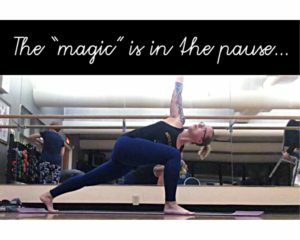 In yoga, you find the pose in the pause. Off the mat, you find space in the pause to commit to goal-directed and values-aligned action. The “magic” is in the pause! I invite you to notice these thoughts and feelings, along with the choices you make. Celebrate your mistakes! Really, I mean this. When you make a mistake, get excited and use your “detective skills” to discover the lesson that can be learned from your mistake. You will likely uncover more flexible and creative ways to respond and react. 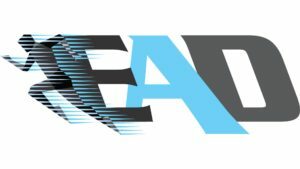 As a performance psychology coach trying to make a positive impact within the sports and fitness industry, I want to give all people the knowledge and tools necessary to take action toward their goals in a healthy way. I don’t offer “quick fixes” or suggest that the process is linear or easy. I’m realistic. The journey is not easy and sometimes you need to backtrack. In the end, I firmly believe the journey is worth it. Given that many of my personal experiences relate to the professional work I do in the area of wellbeing, I often share personal stories and experiences that I feel will be relatable or illustrate how I apply what I teach/coach. I’m always happy to have passengers join me on my journey, so I will intermittently post about my approach and its impact on my progress here, but you’ll be able to keep up with me daily on IG. Here’s to living a happy, healthy, values-aligned life in 2018!! Did you know? As a performance psychology coach trained in behavioral science, I help people create supportive environments in which they live, work, and play. I also help people become more aware of their internal experiences (thoughts, feelings, emotions, urges) and how these experiences influence the moment-to-moment choices they make. 2018 is going to be an exciting year as I continue to pursue my goal to use behavioral science to make an impact in the area of health, sports, and fitness. I am thrilled to have the opportunity to work in collaboration with the coaches of Elite Athlete Development! I love the idea of blending behavioral science with health/sports/fitness. Being a collegiate runner in the past and currently focusing on weight lifting, I have definitely put my BCBA knowledge to the test. I’ve been curious in possibly venturing into that space, but not sure where to start. I personally have followed diets and fitness routines, but not sure if that “qualifies” me to deliver advice on that specifically. Rather, I would probably support the diets/routines that others take by addressing barriers to success, data collection, and being a source of motivation/accountability. I don’t know if I’m on the right track. Where do you recommend I seek supervision? Hi Trent! Are you a member of the ABAI Health, Sport, and Fitness SIG? If not, I’d recommend it (I’m a bit biased, as I am the Chair of the SIG!). We are working on a strategic plan right now to grow the practice area and support behavior analysts who are interested in branching out into those areas. I am also giving a Live Webinar on 1/25 that you might be interested in (https://www.eventbrite.com/e/self-management-self-regulation-skills-for-health-and-fitness-tickets-54352614132). I do offer coaching/supervision for behavior analysts. Send me an email at injewelcoaching@gmail.com if you want to chat more about how we might work together!